In a nutshell: A gripping biopic featuring a powerhouse performance by Bryan Cranston as leading Hollywood screenwriter Dalton Trumbo, who along with ten of his peers was blacklisted and jailed as an alleged communist during the McCarthy era. Dalton Trumbo was classical Hollywood’s leading screenwriter. He was also the biggest name among the infamous ‘Hollywood 10’ blacklisted as alleged communists during the 50s, when McCarthyism was raging in paranoid Cold War America. After serving a jail sentence imposed by an ultra-conservative court, Trumbo side-stepped his blacklisting by secretly continuing to write under various pseudonyms. When two of these scripts were awarded Oscars, and with rumours circulating about the true identity of the author, it was only a matter of time before his writing ban became unsustainable. That time came when Kirk Douglas insisted that Trumbo be publicly credited as the writer of Kubric’s Spartacus (1960). Another instance of life being stranger than fiction, then, but the ludicrous anti-red madness of the time is well familiar, and Trumbo’s true story doesn’t exactly lend itself to high drama (and apparently the filmmakers have adhered, more or less, to the facts). So how does the tale translate to film? Pretty damned well thanks to a sparkling script (although not without flaws – there are a few clunky lines of exposition, for example) and some terrific acting led by a masterful Bryan Cranston, who has the rare capacity to shape-shift into his roles. It is impossible not to initially identify Cranston with his famous and unforgettable Walter character from the brilliant Breaking Bad, but within a few lines you’re back in the 50s in the exclusive presence of the distinctive Dalton Trumbo. Raspy-voiced, engulfed in tobacco smoke, his cigarette-holder a perpetual fixture, articulate and quick-witted, with a suggestion of grandiosity about him (a peer complains that he speaks as if every utterance is to be etched into stone), he comes close to writer stereotype without compromising his credibility as a character. 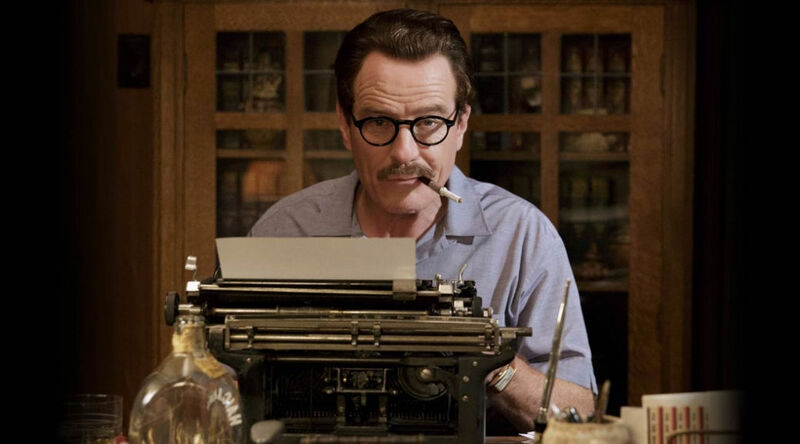 Mind you, Cranston doesn’t quite disappear into the role – he is too mannered for that, but so is Trumbo. Is it possible that this ‘mannered’ quality in a character not be accompanied by a lurking awareness in the viewer that the actor is acting? And does it matter? Well, not in this case, perhaps because Cranston brings an undeniable and crucial humanity to Trumbo, especially in his interaction with his family. This is the arena in which the full price of his victimisation for his political beliefs becomes evident. That, in turn, highlights the courage of his fight for his beliefs, as well as the personal selfishness that is its flipside. He might be prepared to go to jail for his principles, and to work around the clock writing scripts under pseudonyms when he is released, but he sacrifices his family life in the process, jeopardising his marriage and relationship with his kids. Not so simple, the hero fighting the good fight. If Cranston carries the success of the film on his ample shoulders, he is well supported by the rest of the cast, notably Helen Mirren as the bitchy, influential, politically conservative gossip columnist villain Hedda Hopper, Diane Lane as Trumbo’s quiet, grounding wife, and Elle Fanning as his politically active teenage daughter. John Blackman has fun and provides comic relief hamming it up as a producer of trash flicks. All the performers throw themselves into their parts, powered perhaps by a conviction that the film covers a sorry chapter in Hollywood and American history that may hold lessons for today – as indeed it does.